Not only do I love raspberries, but I adore mini desserts of any kind! I love the idea of serving a pretty individual cake instead of a comparatively chunky slice. It’s just so much more delicate and pretty. That’s why making these Raspberry and Lemon Mini Cakes was a no-brainer for me. And here’s the thing, you don’t need any fancy mini cake tins to pull this off, just a good ol’ baking tray and a round cookie cutter! Yes there will be a teeny bit of cake left over after cutting, but it surely won’t go to waste. If you manage to restrain yourself and not gobble it all up in the process, you can freeze the leftover cake and use it for cake pops at a later date! Depending on the size of your cookie cutter, this recipe makes 4 or 5 mini cakes. Preheat the oven to 180°C. Grease and line a large baking sheet (about 25 x 38cm) with greaseproof paper. Cream together the butter, sugar and lemon zest very well, for about 5 minutes. Add in the eggs, beating well after each one. Add the lemon juice to the milk, stir well and set aside for 5 minutes. Sift together the flour, salt and baking powder. Add about a third of the dry ingredients to the creamed mixture and beat well, then add about a third of the milk mixture. Repeat this until all the ingredients have been used. Scrape down the side of the bowl before giving it one final mix. Spread the cake batter evenly onto the lined baking sheet. Bake the lemon cake for 25-30 minutes, then allow it to cool in the pan for 10 minutes. Lift out the cake and leave to cool completely on a cooling rack while you make the raspberry mascarpone cream. Blitz the raspberries with a stick blender or puree with a fork. Pass the mixture through a sieve to remove any seeds. Place the mascarpone into a large bowl and sift over the icing sugar. Mix together with an electric mixer until smooth. Add the cream and whisk on low speed until thick, being careful not to overmix or the mixture will split. Gently fold in the raspberry puree. Once the cake has cooled completely, use a round cookie cutter (mine was 7cm diameter) to cut out rounds. Pipe or spread a layer of mascarpone cream onto each of the cake rounds. Stack 3 rounds of the cakes on top of each other to make a mini layer cake. Spread a thin layer of mascarpone cream around the edges of each cake. I left mine like this – a semi-naked cake! If desired you can refrigerate the cakes now, then spread a second layer around the edges so that the cake is covered completely. 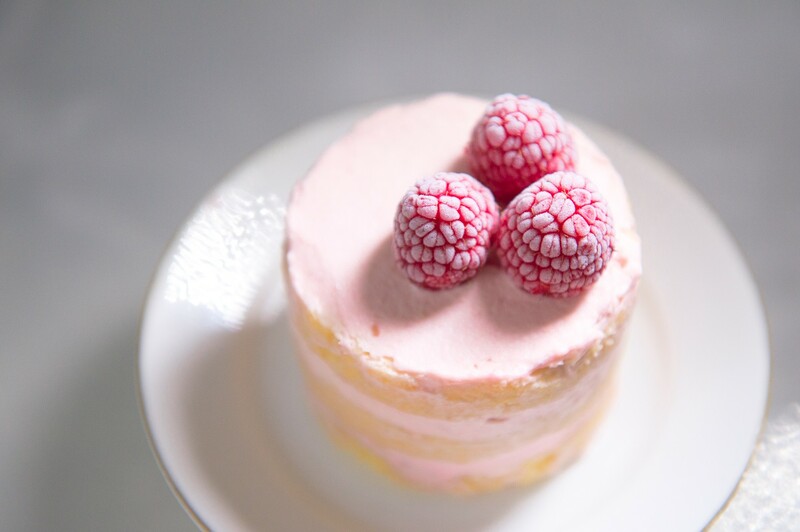 Refrigerate until ready to serve, then decorate with fresh raspberries. These look super good, Astrid. The light pink with the yellow of the cake. I imagine that the zesty flavours with the mascarpone-based frosting must be light and fresh…delicious. Bought some cheap cookie cutters to make mini naked cakes but hadn’t yet found a recipe that fully inspired me to use them…until now : ) Thanks! Hi Marguerite, thanks so much for the feedback! So glad the recipe has inspired you – I’m sure your mini naked cakes will turn out great!